Whether boat buyers are looking for their first boat or need a full-featured pleasure boat in a smaller package, the all-new 193 SC by NauticStar Boats is a perfect choice. This 18′-9″ side console, NauticStar’s smallest sport deck, does not lack in performance. 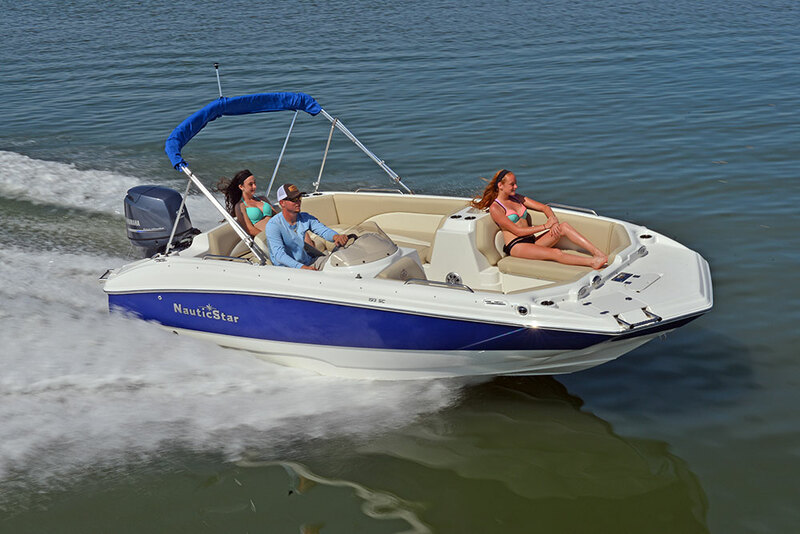 It combines comfort, features, and versatility with economical horsepower for an exceptional pleasure boating package. So, whether cruising, pulling skies, or fishing, the sporty and stylish 193 SC hits all the marks. Deck boat comfort is easily recognizable with ample lounge seating in both the bow and cockpit. The 193SC is no exception—enough room for up to 10 people. Manufactured in-house to ensure best quality, the bow and L-shaped cockpit lounge seats are all hinged for easy access to storage compartments. Beautifully styled two-tone doeskin and Caribbean cream upholstery is not only pleasing to the eye and comfortable, it is also very durable due to the Syntec vinyl with Nano Block stain protection. 11Yamaha Marine performance tested the 193SC with a 90 HP and 115 HP motor. Both produced some very impressive numbers. Powered with a four stroke F90XA, it planed in 4.19 seconds with a top speed of 35.9 MPH, and a fuel burn of only 5.21 MPG at cruise. With the F115XB, the 193 planed in 3.64 seconds and topped-out at 40.5 MPH with a fuel burn of 6.39 at cruise. The 193SC is 18’ 9” LOA, with a beam of 102” and has a horsepower range from 90 to 150. Fuel capacity is 32 gallons. Passenger capacity is 10 persons. Deadrise at bow entry is 40° with the aft deadrise being 12°. Approximate draft is a super skinny 10”. The smaller size of the 193 SC does not mean it lacks features. In fact, it is loaded with standard features as well as a long list of options that can be applied for customization. Boarding is made easy with the molded-in aft stainless steel ladder and walk-thru transom. There is also storage for the battery and other gear under the walk-thru. If drink holders and storage capacity are a hot issue, the 193SC comes with 8 drink holders and 8 storage areas including a ski locker in the deck with shock-and-slam latch. The L-shaped lounge seat and port and starboard bow seats are hinged for easy access. Under the seats the storage is lined for easy clean up and to prevent mildew. The two-tone “doeskin and Caribbean cream” upholstery is not only pleasing to the eye and comfortable but also is very durable due to the Syntec vinyl with Nano-Block Stain Protection. NauticStar manufactures their upholstery in-house to assure the best quality control and offer more value. The portside galley has a manual pump fresh water system with storage accessed through the forward backrest. A 25 Qt. Igloo® cooler is standard and stows in the driver console. The captain’s station has a brushed pewter look dash that includes a trim gauge, fuel gauge, tachometer and speedometer. The helm comes with a padded non-directional wheel. The electrical switches are lit when on for a reminder to cut them off after use. Stereo is standard featuring Bluetooth capability, MP3/USB ports and 2 waterproof speakers. The captain’s chair swivels and slides to accommodate all drivers. A color-coordinated canopy comes standard with an aluminum frame, stainless steel hardware and color-matched canvas. The canopy is easy to open due to the forward legs and “stainless steel fittings.” The canopy top is engineered to take top speeds in the upright open position. There is an insulated cooler in the bow step-up that can be factory converted into a livewell. The cooler/livewell has an overboard drain so that no livewell water drains into the boat. The front deck comes standard with docking lights, a molded anchor locker with anchor and a recessed stainless steel ladder for boarding or off-boarding at the beach. With the addition of an optional casting chair, Minn Kota® trolling motor, and wiring harness, this great pleasure boat can be converted into a serious fishing machine. Because the 193SC has a self-bailing cockpit, cleanup is quick. With the optional carpet unsnapped, a water hose can be used to wash-down the inside of the boat, even in the under seat storage, and the water will run into the stainless steel floor drains and out through the scuppers. Founded in 2002, NauticStar Boats is a privately owned LLC located on 17 acres in Amory Mississippi. With more than 200,000 square feet of manufacturing floor space, NauticStar is one of the top producers of high quality bay boats, deck boats and offshore center console boats from 18 to 28 feet. Professional and sport fishermen, recreational and pleasure boating enthusiast appreciate the many standard and available features that are offered by NauticStar for a customized fit for their lifestyle. For more information on NauticStar Boats’ full line of boats, visit NauticStarBoats.com or call 662-256-5636.